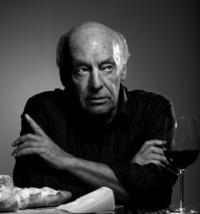 Eduardo Galeano was a Uruguayan journalist, writer and novelist. His best known works are Memoria del fuego (Memory of Fire Trilogy, 1986) and Las venas abiertas de América Latina (Open Veins of Latin America, 1971) which have been translated into twenty languages and transcend orthodox genres: combining fiction, journalism, political analysis, and history. The author himself has proclaimed his obsession as a writer saying, "I'm a writer obsessed with remembering, with remembering the past of America above all and above all that of Latin America, intimate land condemned to amnesia." He has received the International Human Rights Award by Global Exchange (2006) and the Stig Dagerman Prize (2010).